You have the option to change your admin username into whatever you like. I encourage you to do so. 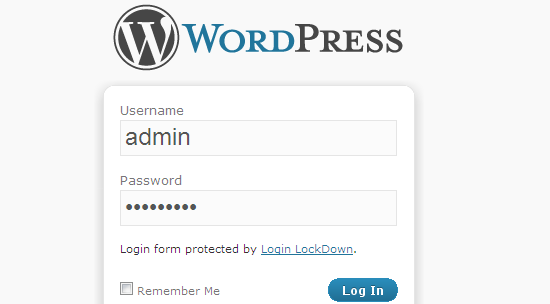 Anybody who tries to get into your WordPress admin section will try with ‘admin’ as a username. If you change it, potential hacker has to hack both username and password. Another way of doing this is, Create a new administrator user, login as that user, and delete your “admin” user account. Potential hacker will try to break your username/password combination using brute force or dictionary attack on your WordPress Login screen. Login LockDown Plugin will prevent that. You can download Login LockDown plugin from here. This will surely secure your website login in much better way than before. There are many places inside your WordPress site that is telling a potential hacker a version of your WordPress installation, as well as other dangerous information. In your wp-config.php file there is database connection info as well as other data that should be kept from anybody to access. From WordPress 2.6 you can easily move this file from root folder location. To do this simply move your wp-config.php file up one directory from your WordPress root. WordPress will automatically look for your config file there if it can’t find it in your root directory. This way, nobody except a user with FTP or SSH access to your server will not be able to read this file. By default, WordPress table prefix is wp_. As WordPress is Open Source, if you leave your table prefixes intact, everybody know the exact names of the database tables. You can change your table prefix during installation by entering new prefix in your wp-config.php file. For changing the prefix after install, use WP Secure Scan plugin. I am amazed how many people, even experienced ones, do not change this keys. A secret key is a hashing salt that is used against your password to make it even stronger. Simply visit https://api.wordpress.org/secret-key/1.1 and copy the 4 generated keys into yourwp-config.php file. It’s that simple. Always update to the latest version of the WordPress, as it is the most secure one. Don’t forget to update your plugins and themes. Updating your WordPress installation, plugins and Themes is really easy to do from your admin, so do it as soon as possible. WordPress is terrific piece of software and y updating you will rarely or never brake some site functionality. AskApache Password Protect Plugin adds some serious password protection to your WordPress Blog. Not only does it protect your wp-admin directory, but also your wp-includes, wp-content, plugins, etc. as well. This is the most trivial task to do to protect your WordPress installation. But, many people use weak passwords which are easy to break to modern brute force attack programs used. There are many tips how to make a strong password, I personally like this Strong Password Generator. Read some tips over there to help you understand what a strong password is. This is not a security tip, but is related. If someone hacks your site and you don’t have a backup, it will be very difficult to return the site back to its previous state. Regular backup is a must. There is a great list of WordPress Backup Plugins available here. Remove unused users from WordPress. Remove all unused WordPress plugins. 1. Search from the WordPress theme repository. All the themes listed in the repository have been scrutinized by wordpress team, so are mostly safe to use.